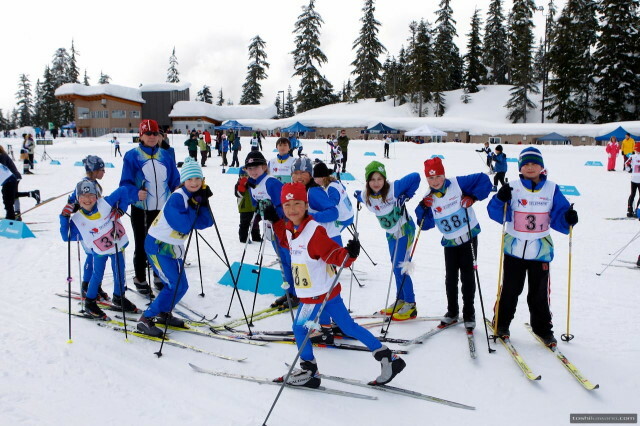 The Jackrabbit Program is a program to introduce children between the ages of 5 and 12 years of age to cross country skiing. The emphasis is on having fun while learning the basic ski techniques. The Jackrabbit program is part of the provincial cross country ski skills development program (CCBC). All leaders, coaches and volunteers are trained and certified by this provincial sports organization (NCCP). The participants are divided into age and skill appropriate groups with 6 to 8 children per qualified leader. The children stay with the same leader for skills instruction throughout the season. Each session begins and ends with all the jackrabbits (all ages together) playing games or having fun relays or races. This encourages the older more skilled skiers to help the younger skiers on their team. The children earn badges as they progress through the skills necessary to become a competent skier. The participants are introduced to three aspects of cross-country during their time as jackrabbits – recreational track skiing, racing and back country skiing. The Track Attack program is designed for skiers who are usually between the ages of 10 and 12, and who are in the “Learning to Train” stage of development. This is the third level of the program. The focus of the Track Attack program is to help participants become technically competent cross country skiers and use their skills to explore a wide range of ski activities and race with confidence. The ski sessions will alternate between skate and classic technique. 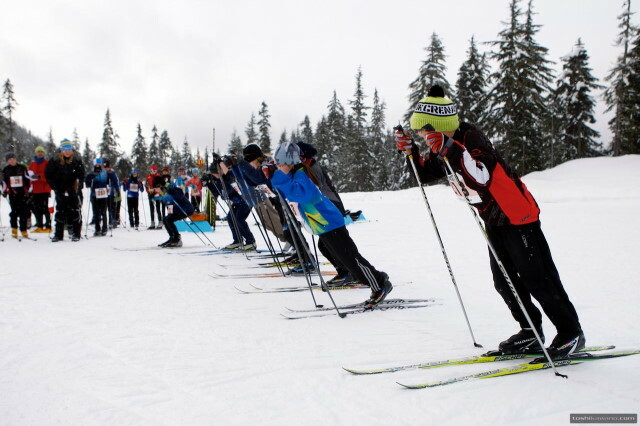 The junior racers have the opportunity to attend a number of races during the ski season – local(Coast Cups), provincial (BC Cups, Midget Championships) and the BC Winter Games. Registration for the program takes place in fall Online at Zone4. Information and equipment sessions, Ski Swap scheduled in November before the on-snow sessions begin. Please check on this web site for registration updates. Warm clothing that allows freedom of movement is essential for the enjoyment of skiing. To have fun in cold weather, dressing in layers is the key. Each layer acts as a barrier, trapping warm air. If overheating occurs, the skier removes a layer. Hats and mitts, rather than gloves, are essential.